I watched the first half of the Illinois game yesterday and one thing became clear: there wasn't much that happened schematically in the game. Michigan just dominated Illinois at every position. The only new offensive play Al Borges rolled out was the counter-draw that we saw last year, and the defense spent much of the game run blitzing. In lieu of regular content this week, and because the bye week came after only four games, I'm going to spend the week doing progress reports for the offense, defense, and coaching staff. First, the offense. Entering his third year as a starter and his senior season, if Denard hasn't already learned not to make those throws, he probably never will learn. Count on Denard to average about an interception--to 1.5--per game. That's the pessimistic angle (the one that makes more sense in my brain) though. The other side of the coin is Denard, Heisman Contender. While I think that's possible, he's going to need to show significant mprovement over last year while playing a more difficult schedule (don't undersell this as a potential explanation for a lack of improvement from Denard). I've never seen a quarterback go from Year 1 to Year 2 under Borges/Hoke, so I'm not really sure what to expect. Early camp reports say Denard is playing extremely well, but camp reports are camp reports. Can Denard surpass his numbers from last year? Yes, but he won't come close to his breakout 2010 season, the kind of numbers he would need really lock down the Heisman. Realistically, given the lack of wide receiver talent (about which more later this week), Denard's totals will probably remain the same while things like his yards per attempt drop as his deep jump balls increasingly fall to the turn. I think it's hard to argue that Denard is anything but Denard. His stats this season are basically identical to his numbers from the same time last year. True, he didn't play Alabama in 2011, but this many similarities are not a coincidence. Despite "Denard Being Denard" being a bad thing occasionally (see: Notre Dame), Michigan is on pace to win its first Big Ten title since 2004 (! ), largely because of him; take the good with the bad. What's most impressive about Denard's passing output is the lack of wide receiver talent. Devin Funchess has emerged as a serious deep threat, and Devin Gardner is an erratic WR-convert, but otherwise, Denard is working with a bunch of slot ninjas in a non-slot ninja-friendly offense. But recently, Al Borges has changed to a quick-hit passing offense that Denard can excel at and better suits the receivers. 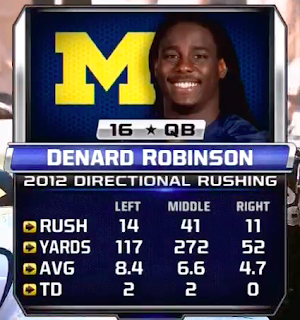 Though his passing stats mirror those of last year, Denard's rushing numbers are significantly improved. He has carried the ball 101 times this season for 804 yards (8.0 YPC) and 6 TDs, a yardage mark that almost matches his total from the entirety of last year (1,176 yards, 5.3 YPC). Denard's improvement can be attributed to Borges' decision to use the inverted veer which appears indefensible. Expect more of the same. Denard isn't poised to be anything that we haven't seen already. He's going to throw interceptions when he's pressured, break long runs a few times a game, and make some miraculous passes that you were certain Denard couldn't make. At this point, we should just cherish the last few games of Denard's collegiate career because Michigan is not going to see another player like him in Maize and Blue again. Next year is the Shane Morris show and a dramatic shift in offensive philosophy. Barring a long suspension, Fitz should continue down the road he ended last season on: 5.5 to 6 yards/carry throughout the year and 15-20 carries a game. Even if he misses a game or two due to suspension, Fitz will likely surpass 1,000 yards this year, but won't get much higher than that. Things have not gone swimmingly. Fitz is only averaging 3.3 YPC this season despite Denard having a great season on the ground. One factor that may explain both of those results is that teams (like Purdue did explicitly) are keying on Fitz in the run game and trying to deal with Denard if he happens to keep the ball. This has not ended well for anyone but Denard and Borges' reputation as a playcaller. Fitz is yet to break the 100-yard mark in a single game. His best performance to date was an 85-yard outing against UMass, which, UMa$$. The backups--Vincent Smith and Thomas Rawls, primarily--have been good-not-great. Rawls is the team's third-leading rusher behind Denard and Fitz with 174 yards (7.0 YPC). He intersperses rumbling, short-yardage carries with flashes of brilliance like the stiff arm that freed him for a 63-yard touchdown against Illinois. Rawls looks like a good option in future Borges offenses that depend on under-center runs and play action, but in this offense, he probably needs a little more speed to be an every-down back. Senior Vincent Smith has been disappointing if you ask me and exactly what you expect if you ask anyone else. He's only carried the ball in three of Michigan's games this year and the one in which he got any meaningful snaps was against Alabama (13 carries for 33 yards). 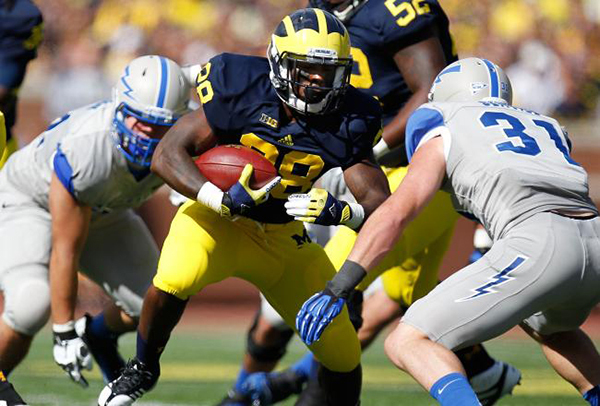 His career as a Michigan running back will end unceremoniously and without fanfare, which is a shame. If Michigan is going to win the Big Ten, they're going to need more production from Toussaint. It's possible that defenses start overreacting to Denard on running plays, opening up lanes for Fitz as the year rolls on, but his problems are beginning to look more inherent in his game. Getting back to the 2011 Toussaint who attacked upfield and took the yards that his offensive line found for him will go a long way to getting this unit back on track. But if Toussaint keeps trying to bounce every run outside and getting tracked down by linebackers, expect Rawls to start receiving most of the carries, regardless of situation. The concern for this year is not that these guys [Gallon and Roundtree] can't catch. They're both sure-handed, underneath receivers with the ability to make defenders miss and gain yards after the catch. The problem is that Al Borges' offensive system emphasizes downfield routes and putting stress on a defense by stretching them vertically (maybe this will force Borges' hand with bubble screens). None of Michigan's returning receivers have the speed or size to scare any secondaries this year. The fear isn't that Denard will continue to heave balls into double coverage as Roundtree and Gallon get out-leapt and out-muscled for passes. It's watching these guys struggle to get separation from defensive backs and Denard being forced to make pin-point throws underneath, something he's capable of doing but not particularly consistently. With the emergence of Devin Funchess and Devin Gardner as Michigan's primary deep threats, those fears have been mitigated. Jeremy Gallon currently leads the team with 15 receptions for 287 yards, but only one touchdown (that coming against Illinois; pitcured above). Roundtree slots in fourth behind Funchess and Gardner with 11 catches for 128 yards. The primary reason this squad has held their own has been Borges' decision to abandon the downfield passing game and stick with screen passes and middle-range routes. Gallon is the shiftiest of the bunch but still doesn't strike me as a serious gamebreaker. He's the recipient of most of Michigan's throwback screens that are typically well blocked downfield, but he has never shown the ability to get real separation and threaten secondaries. Roundtree, meanwhile, is responsible for the over-the-middle routes the move the chains and little else. By the end of 2011, Hemingway had 34 catches for 699 yards and 4 TDs. Gardner probably won't surpass those yardage numbers but with 14 receptions for 243 yards yards, he's an adequate sub. More importantly, Gardner has become a legitimate red zone threat, catching 4 TDs already. When Michigan gets near the endzone, Denard has targeted Funchess and Gardner most frequently. Gardner benefits from targets in the red zone because there's less ball adjustments that need to be made, which allows him to dominate with his athleticism. As Gardner learns the position more, he'll become better at adjusting to downfield throws and develop into Michigan's unquestioned top receiver. We've seen Gallon's ceiling, but he has also been one of Michigan's most consistent performers. He rarely drops passes and generally makes the right reads with the ball to garner the most yards after the catch. Players like Drew Dileo and blocking-only Jerald Robinson will moonlight occasionally in the passing game, but the only receivers you'll see with regularity in box score are Gardner, Roundtree, and Gallon. In the season preview, I included tight ends with the offensive line because "chances are we'll see the tight ends used only when the offensive line could use some extra bulk in short-yardage situations." So.... that was wrong. Michigan's most dynamic offensive player not named Denard this season has been Devin Funchess, the 6'5" beanstalk that catches everything thrown his way. Along with Gardner, Funchess provides Denard with a downfield/red zone threat. Only six games in, Funchess has 10 receptions for 173 yards and 3 TDs. MGoBlog has been tracking Funchess to see when he will surpass Michigan's all-time leading tight end receptions leader Jim Mandich. The nominal backup tight end is Mike Kwiatkowski who probably plays more snaps than Funchess but doesn't receive the glory because he's primarily a blocker. But as the season rolls on, it appears that Kwiatkowski might be a really good blocker. Rewatching all six of Michigan's games, I can't remember a single time of him being beaten off the line of scrimmage. Combine that with his downfield blocking (see: Gallon's screen pass touchdown from Saturday) and you have two quality tight ends at a position that seemed dire entering the season. The third stringer is AJ Williams, a battleship blocking tight end that only gets on the field in heavy/short-yardage sets. This is all about Funchess. The other tight ends are playing well in their limited roles, but Funchess may be Michigan's most talented player, or at least the one with the highest ceiling. 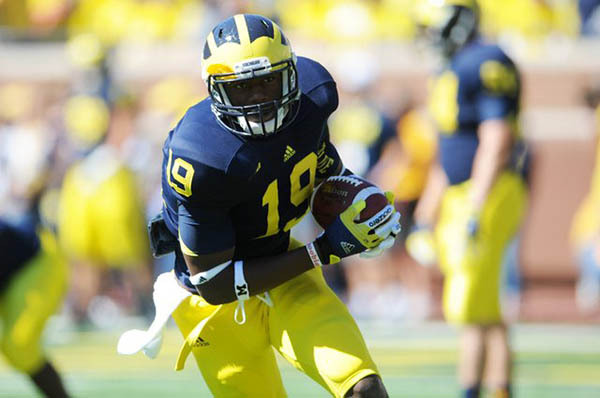 Barring academic and personal issues or injury, Funchess is a lock NFL draft pick. This team hasn't had someone with that kind of ceiling and talent combination in years. Despite a few new names, it's hard not to see this as one of the team's strongest units this year barring injury. The team has collectively averaged over 5 yards/carry each of the last two years, which is not something you can do without a stellar offensive line. Expect a few of these guys on the All Big Ten team by the season's end and some national recognition for Lewan, who, begin to pray now won't forego his senior year to enter the NFL early. This has not really been the case. Michigan's interior line has been beaten by Notre Dame and Alabama's front seven, but did manage a fairly good outing against Kawann Short and Purdue's front line. On the outsides, Michael Schofield has probably been the offense's worst player while Taylor Lewan has reverted to his freshman form of jumping before the snap. The loss of David Molk shows more than at the center position. He was the player calling out protection, reach blocking, and directing the rest of the line. With Elliott Mealer and Ricky Barnum filling two interior line positions, it was clear early on that the offensive line was struggling to play as a unit. The last two weeks, whether it was inferior competition (unlikely given the presence of Purdue's Short) or genuine improvement, the interior line has looked coordinated and powerful once again. The edges are a little more concerning. 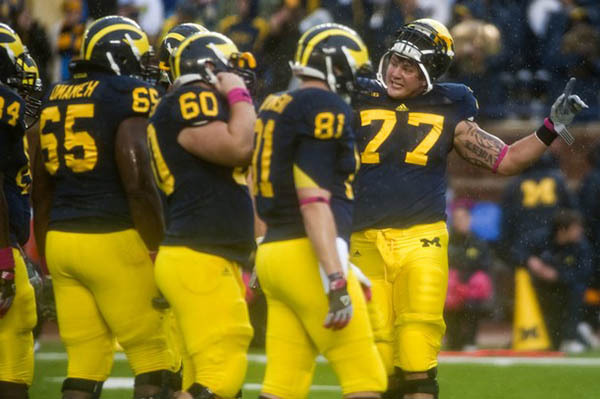 Lewan has not looked like the All-American he was presumed to be this season, but there are lingering rumors of an injury. This wouldn't surprise me given how often he's been flat-out beaten off the line. The false starts may be a function of this injury and his mental preparation to get a head start. Schofield doesn't have the pedigree that Lewan does and has struggled throughout the year. He's had difficulty holding blocks in the run game and has been beaten in the passing game as well. The disparity is so great that Michigan has become an entirely left-handed running team (see: right). There needs to be improvement across the line for them to be elite. For Lewan, that might just mean getting healthy, and as the middle of the line continues to gel, their performance should improve accordingly. Schofield is the wildcard. If he can up his game to the level of his linemates, the offensive line may once again be the best unit in the Big Ten, but unless Schofield can get his issues sorted out, this will always be a one-sided offense. Breakout star: Devin Funchess, duh. Most disappointing: If I could put Al Borges here, I would. I'm worried he'll lose Michigan at least one game trying to go back to I-formation football. I hope not. In lieu of that cop out, probably Jeremy Gallon. Most disappointing: Borges probably helped lose Michigan the Notre Dame game already. Otherwise, Gallon has been very good. Most disappointing is Fitz Toussaint who hasn't gotten on track yet. I think you downplay Gallon's abilities too much. He is a gamebreaker IMO and needs more touches 6-7 per game. Whether its via screens, passes or runs. The guy was a great athlete coming out of HS and is easily the best guy with the ball in his hands (other than Denard) on the team. He also consistently got open vs. Bama only to have Denard under or overthrow him. They did connect for that 71yd bomb though. Gallon > Gardner this season. They need to get him the ball more.